This weekend I was stoked to grab some Saturday pancakes with celebrity Makeup Artist, Elle Leary. Elle has painted the recognizable faces of varying talent including Josh Duhamel, Ron Artest, Ellen Page, Paul Rudd, Pat Sajak, Alanis Morrisette, Dane Cook, Jennifer Coolidge, Steve Carrell, Pete Wentz, and more. In addition to this uh-mazing clientele list, Elle has created looks for assorted publications such as, Vogue, Harper’s Bizarre, Nylon, 944, and Out. As Elle is (pretty much) bi-coastal these days due to her demanding schedule, I was super fortunate that she could meet me for some pancakes! Although I had several places in mind for our brunch, Elle informed me that she is actually intolerant of pancakes with gluten; needless to say, I had to scratch my original ideas. 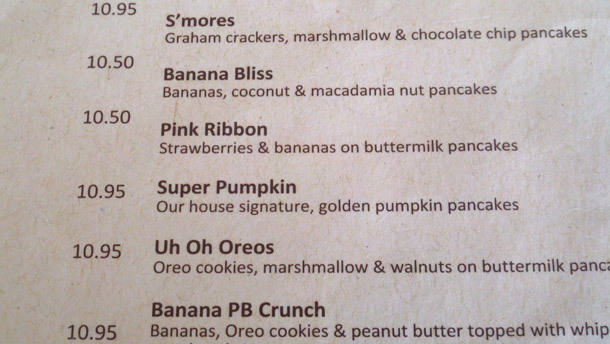 After violently searching the internet for gluten-free pancake options in LA, turns out the restaurant with the most variety is (where else?) BEA BEA’S! Yes, yes, I know what you’re thinking: I’ve already reviewed here! While I did come across Hugo’s and Jacks n Joe during my gluten-free search, their options weren’t as enticing as Bea Bea’s. If I’m getting an awesome Guest Reviewer for a Ma’amCakes piece, I must take them to the creme de la creme of gluten-free pancake spots! Now, typically, I very much dislike the end of summer. However. 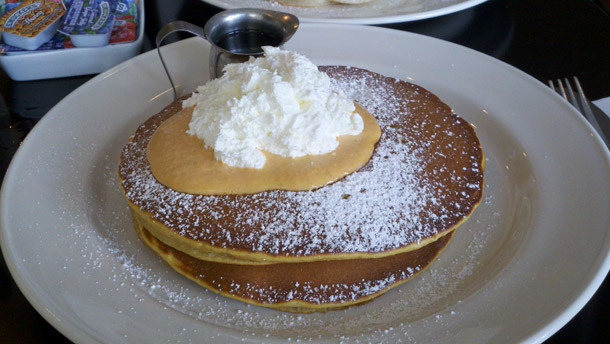 Looking at these beautiful, orange, autumn pancakes really got me to embrace the change of seasons. “Pumpkin pancakes topped with pumpkin cream cheese marmalade and whipped cream” – who would have guessed that translated into “when you bite into this dish, you can actually taste Thanksgiving!”I have reviewed pumpkin pancakes once before at Doughboys; but by a fraction of a turkey-feather, the Just For You Pumpkin Pancakes at Bea Bea’s may have taken the cake – er, pancake. 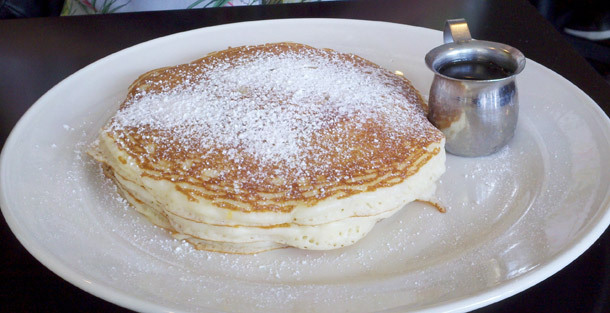 I must say, although I’ve never had gluten-free plain pancakes at Bea Bea’s, these looked anything but plain! Elle agreed, when she shouted “um, these are insane!” When taking a Guest Reviewer for breakfast, it’s (obvi) really important that my guest is 100% satisfied. In deciding where to take Elle, I was a bit nervous because of her food allergies; however, once we agreed on Bea Bea’s, I realized I had nothing to worry about! “Seriously, the consistency is almost the same as regular pancakes. It’s SO hard to find gluten-free food that tastes similar to regular food, but these really do!” Phew. During our meal, I noticed Elle poured the entire cup of syrup on her Jumpin Jacks, and then asked our server for another cup. “Oh yea,” she said, “I’m a syrup junkie. When my dad used to make me pancakes as a kid, I’d always pour syrup on, roll ’em up, and eat ’em – but in the comfort of my own home, of course!” Don’t worry Elle, we won’t tell anyone! Besides. Who doesn’t have their own quirky food habits?! Thanks so much, Elle, for being a part of Saturday morning brunch with Ma’amCakes! Keep up with Elle’s awesome beauty blog, The Lash Effect, and her YouTube channel, Elle Leary Artistry, where you can check out her super helpful beauty video tutorials!